Driving laser diodes is especially easy when the required control circuit is integrated into a single IC or driver board. 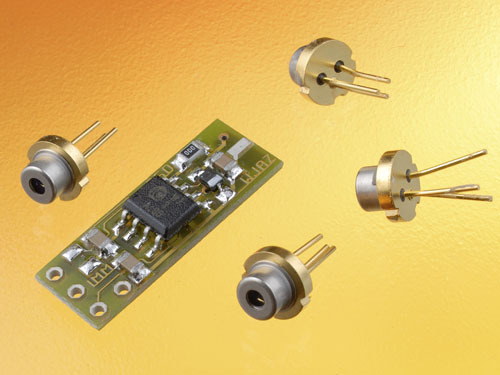 The driver iC-WK can control cw lasers up to 60 mA. With an external power transistor it can control cw lasers up to 4 A. It requires only four external components: three capacitors and one resistor that regulates the power flow to the laser diode. The temperature-independent and supply voltage-independent monitor current is used as a reference because it is controlled at a rate better than 1%. The supply voltage ranges from 2.4 to 6 V.
During development the main goal was operation safety. Therefore, protection elements against reverse voltage, electrostatic discharge, overheating, and currents that are too high were integrated. 150 µs after applying the voltage, operation begins with a quick, soft start. In case of error – for example, too high a current after failure of the feedback loop or overheating of the chip – the laser current is cut off immediately and permanently. A restart requires applying new voltage. In this way, power supplies and batteries are spared and the laser class is maintained. The iC-WK series is available in SO8 and MSOP8 housings and is suitable for all connection types of laser diodes (P/M/N). It is also less expensive than its predecessors.